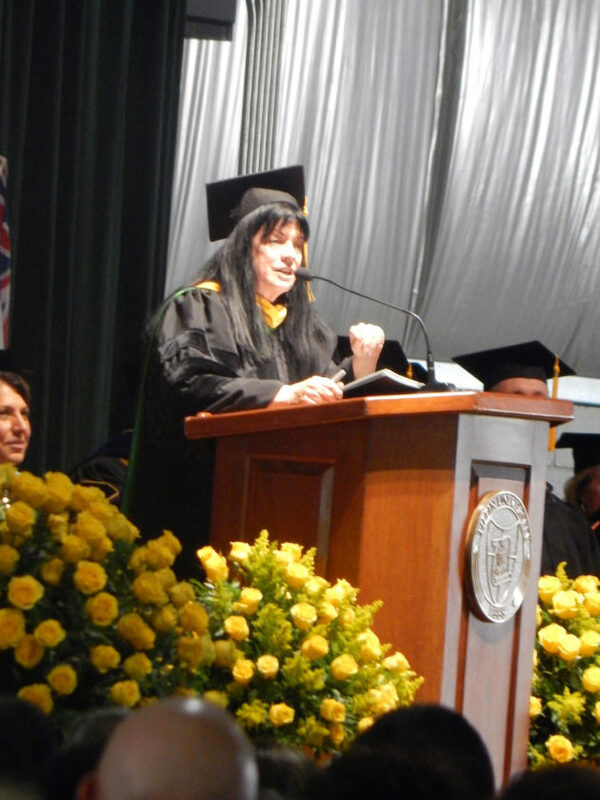 PHOTO BY NICOLE WALBY Donna Graves, keynote speaker for the 2018 commencement ceremony at Tiffin University, addresses graduates Saturday. The class of 2018 from Tiffin University celebrated Saturday during the 130 Commencement ceremonies. More than 800 undergraduate and graduate students earned degrees during the ceremony at Heminger Center on TU’s campus. During the ceremony, new graduates heard from Donna Graves, co-founder, chief executive officer and president of NCompass International Inc., who delivered the keynote address. Graves, a marketing professional with brand activation experience with Fortune 500 companies, said she took time to reflect on what she would tell students and decided to reveal five lessons she has taken away from her life experiences and career. 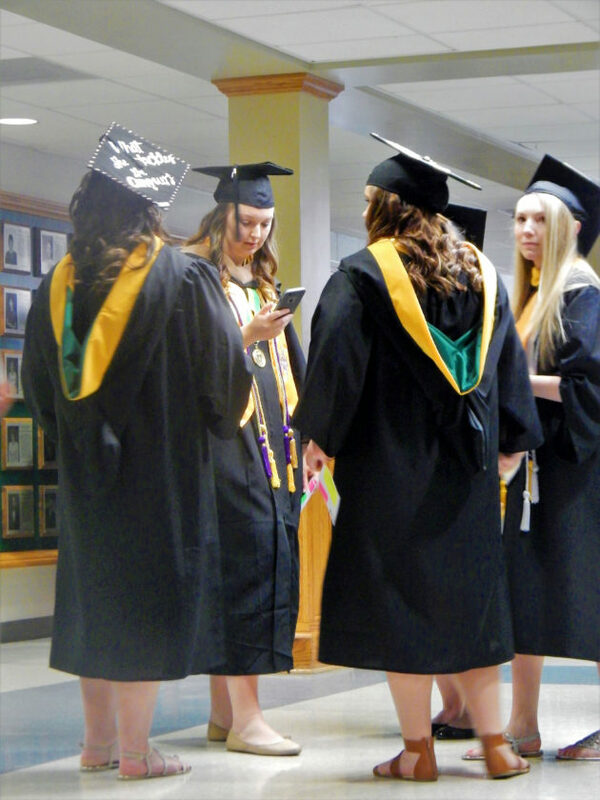 PHOTO BY NICOLE WALBY Students await becoming graduates Saturday during the 2018 Tiffin University commencement ceremony. Words of advice Graves gave students were convert your passions — not just think, but do; great is not good enough — you must be exceptional; learn something new every day — never go to sleep without learning something new that day; embrace fears and rejections — use your fears as motivations; and to remember and respect all those you have left behind. Among the graduates is Taylor Lewis from New Baltimore, Michigan, who earned a bachelor’s degree in forensic science Saturday. Lewis has been a member of the TU women’s soccer team for four years, member of the National Society of Leadership and Success and the president of the American Chemical Society student chapter Lewis also is a teaching assistant for the chemistry lab. Lewis said she chose TU to have the opportunity to play soccer and majoring in forensic science. Her college experience has been amazing, she said. “While traveling with the women’s soccer team, I had to manage my schooling, which gave me a lot of discipline,” Lewis said. During her first three years, Lewis said she was part of a losing team, but during her senior year the team gained success, finishing third in the Great Lakes Intercollegiate Athletic Conference. Lewis is to attend the University of California, Riverside to earn her doctorate in chemistry. Tiffin University also is home to many international students, including Svetlana Gudenkova of Uzbekistan who earned a bachelor’s degree in criminal justice, majoring in criminalistics and law enforcement. Gudenkova’s family is of Russian origin and moved following the collapse of the Soviet Union. At the age of 12, her family decided to move to Columbus. Sports and major was what brought Gudenkova to TU. Gudenkova said it was a challenge to balance soccer and school, but she eventually learned how to manage her time. “I started to get more involved on campus and joined several different clubs,” she said. Gudenkova was a member of the martial arts club, criminal justice club, secretary of the shooting club. She also received training with the community Emergency Response Team and NARK II, which is an on scene drug test to help establish probable cause for police officers. “Now that I am about to graduate, I can tell you that I have improved significantly since I first came to TU,” she said. Gudenkova said her English — speaking and writing — have improved. “College has taught me to love to read books and to value knowledge,” she said. Gudenkova also said her critical thinking skills have improved and she has learned a sense of self through college life. Gudenkova plans to pursue a master’s degree in criminology at The Ohio State University in the fall and work as a full-time police officer at the Columbus Police Department. For her long-term goal, Gudenkova said she would like to advance from a police officer to investigations and to work as an agent with the Drug Enforcement Agency.